This dessert is like a big kiss on the lips. All of the toffee and pecan flavor will have you reaching for another slice. Line a baking tray with greaseproof paper and lightly oil a 23cm/9in springform cake tin. Put the pecans and biscuits into a food processor and blend to a coarse powder. Melt the butter in a small pan and pour into the food processor with the motor running. Blend until the biscuits and butter are thoroughly combined. Place the crumb mixture into the cake tin. Spread evenly over the base and press down lightly with the back of a spoon. Place the tin in the fridge and leave the base to set while you make the filling. For the filling, put 200g/7oz of the caster sugar in a saucepan with the cold water and heat gently until the sugar dissolves, stirring occasionally. Bring the liquid to the boil and cook for 4-5 minutes without stirring until the sugar syrup turns a deep golden brown. Swirl the caramel around the pan gently as it bubbles. As soon as the caramel is the colour of toffee, remove from the heat and carefully pour onto the lined baking tray. Tilt the tin so the caramel covers the base evenly. Leave to cool and set. Melt the chocolate in a heatproof bowl over a pan of simmering water. Take off the heat and leave to cool for 20 minutes, but do not allow to set. Preheat the oven to 180C/350F/Gas 4 and boil a kettle of water. Put the cheese, cream, remaining sugar, egg yolks and eggs in a food processor and blend until smooth. Gradually add the cooled chocolate with the motor running and blend until just mixed. Put a large piece of aluminium foil on the work surface. Place the tin in the centre of the foil and bring up the sides to create a foil bowl around the cheesecake. Place in a medium-sized roasting tin and add enough just-boiled water to rise 2cm/¾in up the sides of the tin. Carefully place the roasting tin in the centre of the oven and bake for 45-50 minutes. The cheesecake is ready when it is almost, but not fully, set. Lift the cake tin from the water and peel off the foil. Put the cheesecake in the fridge, cover and chill for at least two hours before serving. To serve, carefully release the tin and slide the cheesecake onto a flat serving plate or cake stand, using a palette knife to help you. 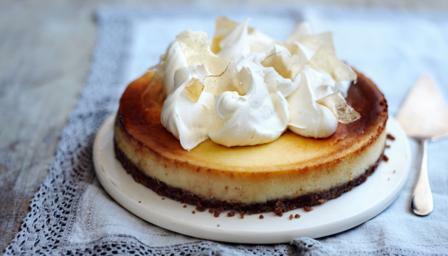 Whip the cream until soft peaks form and spoon in big fluffy clouds over the cheesecake. Scatter the remaining shards of caramel on top. Serve in wedges.